HI! My name is Peggy, and I am a sixty-something woman living in Northwest Montana. Although I am a west coast “transplant,” like most of the Montana women I know here I grew up with shooting. I learned target shooting with a 22 rifle as a youngster right along with the boys, and have gone rifle and shotgun hunting for deer, ducks and grouse for years. But handguns are a newer addition to my life. When I tried shooting a pistol about 30 years ago I found the experience unsatisfying and was extremely discouraged when my initial attempts didn’t even come close to hitting the target. My best friend and husband of twelve years – Gary , on the other hand, was a competition hand gun shooter and rifle marksman with military as well as a hunting background. He reloads and has done a lot of his own gun smithing. He is also a certified NRA Basic Pistol instructor. I help him with class set up and paperwork, and when I have fully retired from my “day job” – also plan to get my NRA certification. Classes are taught in a fifth wheel set up at our home range, and the focus is on teaching couples – primarily retirees – who seek a general working knowledge of safe handling and shooting of pistols mostly for self defense in the home and while traveling. We started a leather making business a couple of years back as a “retirement” business – which has developed into a specialty – every day carry and concealed holsters for handguns. Gary custom makes each holster using the REAL gun. This has given me the opportunity to study and handle a lot of different guns – revolvers and semi autos. Over time, with encouragement and training, I have come to understand pistols better and learned to shoot reasonably well. And I admit I am now hooked on target shooting with a handgun. My goal with this blog is to share my experience as a woman coming to know handguns later in life. There are many aspects of shooting that are unique to women, and to the older woman in particular. I want to create a space to share training, resources, encouragement and stories that help make firearms a safer and more enjoyable part of a mature woman’s life. I know we just recently crossed paths, but because I find your blog simply wonderful, I have put you up for one or two awards (you can accept one, both, or neither, LOL); The Sunshine Award and the Sisterhood of the World Bloggers Award. All the information you need is over at http://musingsfromaworkaholic.com/2014/04/20/sunshine-sisterhood-sunday/ I absolutely get it if you have so much going on that you don’t post, but wanted you to know that I really enjoy your posts, and wanted to share them with my readers, as well. Thank you so much for including me in your nominations. I am not sure exactly how all of this works, as this is a “firstie” for me! It will take me a little while to respond while I figure it out, but I do intend to! Thank you for your encouragement and the nominations. I continue to enjoy and look forward to more of your work! I can’t wait to read the new one, Peggy! The current one is very informative, and as a woman who intends to get a conceal carry permit? Good info! I have been hunting for a few days for just your sort of blog. 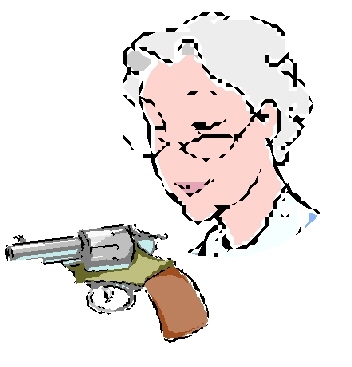 A woman, over 60 that shoots has a functioning blog. Keep up the work. I will check back later. Wow! Congrats on the new name. Nice.